2015 Yves Cuilleron, Saint-Joseph Rouge “Les Pierres Seches” Northern Rhone, France. Founded back in 1920, the Cuilleron family domaine from the tiny hamlet of Verlieu in Chavanay is a Northern Rhone specialist and one of the great names in the region now with Yves Cuilleron making the wines having taking over from his uncle Antoine in 1987. Since which he has built a new facility and built up the vineyard holdings to an impressive 52 hectares that includes great parcels in Condrieu, Cote-Rotie, Saint-Peray as well other unique sites, and of course his specially, prized blocks in Saint-Joseph where he makes some of his best wines like this Les Pierres Seches Rouge. Yves style is refined, elegant and clean letting the terroir and grapes to speak in their own voice and allowing each vintage to show it’s distinct personality, and in 2015, a grand year in the Rhone, it is without question one to buy as much as you can, in particular the Cuilleron reds, again like this one, it’s outstanding and a great value. 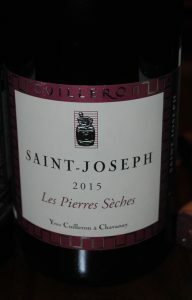 Tasted twice, once blind, the 100% Syrah, 2015 Cuilleron Saint-Joseph Les Pierres Seches is thrilling and very Cote-Rotie like with gorgeous perfume, loads of glycerin and beautifully defined Syrah purity, it starts with violets, game, blackberry and mineral notes on the nose and layers of boysenberry, damson plum, blueberry and cassis on the medium/full palate as well as an array of spices, flinty rock and subtle wood with minty herb, olive tapenade, peppercorns, garrigue, light cedar and a faint meatiness. The tannins are velveteen, but still firm and while the acidity is slightly lower in this vintage, there is plenty of vitality and energy here, it gains an opulent and textural mouth feel with each sip without dulling the excitement one bit, this is fantastic stuff. Cuilleron employs partial whole cluster, just enough to get a bit of tension, and allows lengthy ferments on the Cru (lieu-dit) wines before aging in mostly used French oak for 18 months, the wines see a light fining and all along the way gentile techniques are used to ensure clarity of form and elegance, which really shows in the quality across the range. This is a do not miss wine, and a killer deal, though you’ll also want to check out the old vine 2015 Saint-Joseph Rouge Cavanos ($36) as well as Cuilleron’s 100% Viognier 2016 Condrieu La Petite Cote ($52) and his Roussanne & Marsanne masterpiece, the 2016 Saint-Joseph Blanc Digue ($44) which I reviewed last month. Cuilleron’s lineup from bottom to top is wildly engaging and filled with stars, though this Les Pierres Seches way over delivers in the quality v. price ratio and it should go a decade and then some in bottle.